Waterview Wedding Photos are set on the tranquil shores of Lake Zoar in Monroe, Connecticut. The Waterview is an extravagant wedding venue, known for its romantic gardens, lakefront views, lavish ballrooms, excellent fare, and personalized service. The 44,000 square foot, 13 acre venue has been awarded five stars by both The Knot and Wedding Wire and it is among Connecticut's finest wedding locations. The owners of the Waterview, Elegant Banquets, also own three other prime event facilities in the Connecticut area -- the Riverview, the Candlewood Inn, and the Fox Hill Inn. Waterview Wedding Photos are still unique though, with an ambiance only found at this space. In this photograph the groom is sharing an emotional dance with his mother. It is a precious memory frozen by the flash of the camera, for the mother and son to cherish forever. The groom’s attire strays from the traditional dark suit and white dress shirt typically seen on men at weddings. This groom choose to wear a white tuxedo, lined with black. The dress shirt he wears is also jet black, contrasting with his white tie and red calla lily boutonniere. 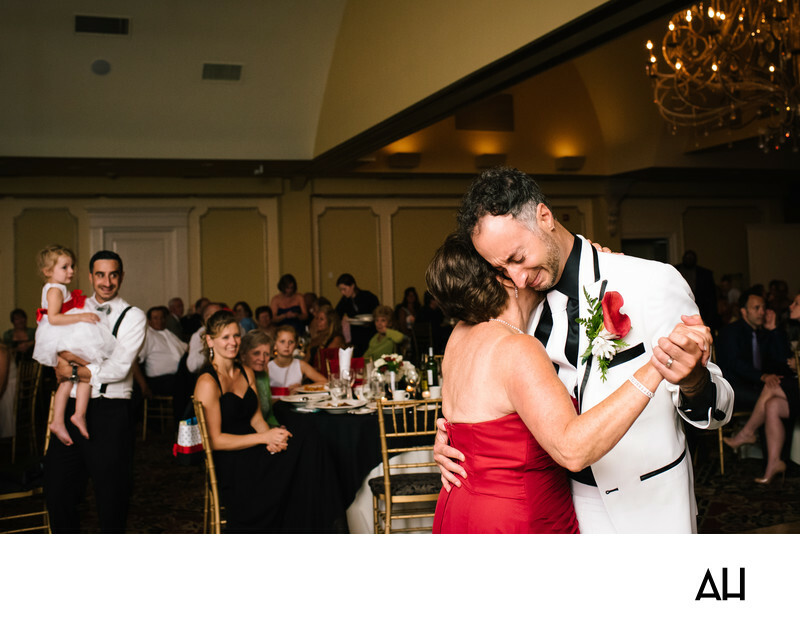 The red of the mother of the groom’s gown matches the vivid color of the flower on his jacket as they share this moment on the dance floor. Tears flowed from the eyes of both mother and son for the nostalgia brought on by the song and the happiness of the groom’s wedding day. It is the mother’s own “giving away” of her son to his new wife. She has raised a good, kind, loving man who has made her infinitely proud over the years. Now she hands him off, to start a family of his own and, maybe someday, raise a son of his own.